There is no shortage of eateries to satisfy a pre-noon craving in Los Angeles. From classic comfort food to wholesome plant-based fare and global cuisine, LA is awash with brunch options. Here are our top 10 spots to help you start your day off right. 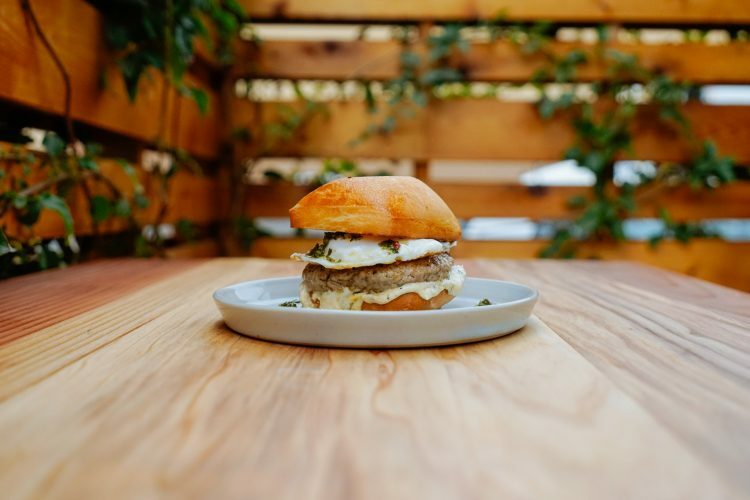 New, noteworthy restaurants are constantly popping up across Los Angeles’ downtown Arts District, often tucked behind industrial exteriors only to reveal crowded, lush patios. One of the most memorable is the Urban Radish, a delightful market-and-eatery hybrid in the heart of the historic Arts District. Their menu is diverse, ranging from a Lebanese breakfast featuring kalamata olive toast to a colorful acai bowl. The Urban Radish is especially well-loved because of its approachable and friendly atmosphere. This homegrown ambiance attracts young professionals, local downtowners and families to its sunny patio and bustling organic market. Messhall Kitchen is the ideal spot to bring the whole family: ample seating, friendly wait staff, and a crowd-pleasing menu. The charming interior decor is reminiscent of kids at summer camp (think wood paneling, earthy brown and green tones, and, of course, a canoe mounted on the wall). Easily found along Los Feliz Boulevard minutes away from historic Griffith Observatory, Messhall is known for its impressive weekend brunch. Leisurely Sunday mornings should absolutely feature this restaurant’s coffee cake french toast, complete with coffee-infused whipped cream and oat crumble – perfect for the caffeine fiend in your life. For more savory options, the parmesan crusted eggs or smoked salmon benedict should suffice. Enjoy the food and ponder balmy summers on the lake. Passers-by often wonder if the long line and crowds are worth it, but at Gjusta, we argue that it absolutely is. This Venice darling opened in 2014, alongside its partner restaurants Gjelina and Gjelina Take Away. If you’re looking for quintessential Californian breakfast food to start the day, Gjusta is the best option of the three. The bakery-café-deli offers everything from freshly baked bread, meat options and a full menu featuring anything-but-basic sandwiches, salads with farmers’ market-sourced veggies, and comforting bowls. A few highlights: Turkish eggs, nestled in a chickpea and harissa stew ideal for chilly, overcast days, and the lox rosti completed with dill, crème fraîche, and bright pink pickled onions. Nothing quite captures the aesthetic of West Hollywood like Joan’s On Third. This West Third Street mainstay opened its doors in 1995 and effectively put the neighborhood on the map, only increasing in popularity since. Visit this much-loved spot for its incredible pastries (strawberry buttermilk muffins go especially well with an Americano), lively atmosphere and tried-and-true recipes. Breakfast options include favorites like the fried egg sandwich or crunchy made-from-scratch granola. For brunch, make sure to order the Chinese Chicken Salad, a definite Joan’s classic. Guests might even catch a glimpse of Joan herself, the dynamic mind behind the café and restaurant, who often works behind the counter alongside employees. Jessica Koslow’s renowned Virgil Village café appears on all LA foodie lists – and for good reason. Koslow started her career by creating and selling fruit preserves, which still deserve recognition for creative flavors like Raspberries & Cardamom and Blueberry Rhubarb, before opening Sqirl in 2015. During the past four years, the corner restaurant has attracted long lines and plenty of attention across the country, quickly becoming a Silver Lake icon. The homey restaurant underwent renovations in 2018, resulting in a more spacious dining room and kitchen to meet the ever-growing demand. Patrons, often with their canine companions in tow, enjoy some of the best items on the imaginative menu: thick slices of brioche toast, shakshuka or potato hash with ‘lacto-fermented’ hot sauce. Another favorite in centrally located Los Feliz is All Time: a quaint breakfast and brunch bungalow on Hillhurst Avenue. Those seeking a cozier breakfast experience won’t be disappointed at this neighborhood go-to; the interior is decorated with eclectic prints, plants and plentiful natural light. Menu options feature both savory and sweet within an affordable price range – one dish to highlight is the B.O.A.T (or, Best of All Time), which, in celebrating Los Angeles’ global cuisines, includes plantains, fried eggs, black beans, avocado and warm corn tortillas. Fresh Bread at Lodge Bread Co. If bread is your thing, then make sure to stop by this Culver City gem, which absolutely deserves more attention. Lodge Bread Co. offers up warm loaves of bread baked in-house, such as a filling seeded country and bold German-style rye. The drool-worthy menu is full of wonderfully glutinous breakfast food. Toast is, as you’d expect, the meal’s highlight. Ask for the ricotta and jam for a creamy, sweet option. For savory lovers, the charming bakery and café also makes a cured fish plate worth trying. At this location, it is hard to not take a loaf home for snacking later. Santa Monica’s Huckleberry feels like a comforting kitchen back home: the aroma of fresh pastries wafting from the doorway, the humble wood furniture and smiling staff. It is the ideal spot to grab a fulfilling meal before hitting the pier. Huckleberry’s strength is in its simplicity – there are no surprises, just classic, straightforward food that makes you feel happy and nourished. What more could we ask for? Dad’s Pancakes are perfectly fluffy and served with either blueberries or chocolate chips (take your pick), while the Country Breakfast features all the hallmarks of good American breakfast: soft scrambled eggs, flaky biscuit, bacon and potatoes. There are also pre-prepared options to accompany you on any southern California adventures planned for later in the day. Any Los Angeles breakfast list would be amiss without a to-die-for breakfast burrito option. And it’s challenging to find a better breakfast burrito than the one at Tacos Villa Corona in Atwater Village. Potatoes, eggs, optional meat and veggies are wrapped into a chewy, sturdy tortilla – there’s a reason this mom-and-pop stop is adored by locals and often boasts a long line on weekend mornings. Hungry people are willing to brave the wait for the enormous breakfast burritos that made Tacos Villa Corona famous, attracting names like the late, great Anthony Bourdain. Originally take-out only, the restaurant expanded its hours last year, so breakfast burritos are available for lunch and dinner, too. Food journalists-turned-restaurateurs Heather Sperling and Emily Fiffer opened Botanica along Silver Lake Boulevard in 2017 – and it is everything a Silver Lake restaurant aspires to be. After fawning over a curated front-of-house market stocking select wine and coffee, guests are ushered into a gloriously well-lit space, replete with a long bar and banquet seating. Perfectly unkempt flower arrangements match the vegetable-heavy menu items, which feature a curated handful of herbs and greens – even the occasional edible flower. Prior to a walk around Silver Lake Reservoir, indulge in the decadent orange-almond tea cake topped with cream and fruit. The menu proclaims, “Cake for Breakfast!” and one can’t help but agree, especially when the cake is this beautiful and delicious. Vegans and carnivores alike love Highland Park’s unforgettable – and entirely vegetarian – Kitchen Mouse. This east LA spot is hard to miss on Figueroa with its spacious, bright and often-crowded dining room. Even the tiniest details at Kitchen Mouse are given attention: crafty macramé and wildflower bouquets create a cheerful ambiance reminiscent of your quirky aunt’s impeccable eye for vintage home decor. Popular menu choices include warm grain bowls topped with shishito peppers and cilantro-ginger chutney, or cashew yogurt parfait featuring a rainbow of fruit, seeds and nuts. Pair this with a dandy latte (espresso’s most delicious and caffeine-free alternative made from dandelion and chicory root) and you will be feeling like you belong in one of LA’s hippest neighborhoods.